Use This Secure Form to Make an Inquiry or to Register Now. Register Online on This Secure Server NOW! IMPORTANT: Every person in your party must fill out a separate registration form and submit it separately. CONDITIONS OF BOOKING: Payment for participation in the Tour to Peru ("Tour") that person registering for Tour ("Tour Participant") has selected below constitutes full agreement with the terms and conditions mentioned below. CHANGES IN ITINERARY: Even though changes to the printed itinerary are not anticipated, the Tour Organizers reserve the right to make any changes that may become necessary in the best interest of the operation of the Tour, with or without advance notice. In such cases, any additional expenses must be borne by the Tour Participants. In the event of any change in rates of exchange, tariffs, or itinerary, resulting additional costs, if any, must be paid by the participant before departure or as soon as the change becomes known. Changes will not result in a refund of any portion of the Tour fee. NO GUARANTEES: There is no guarantee, stated or implied, made by the Tour Organizers, regarding any aspect of the Tour. Complaints about the Tour will not result in any partial or full refund. There is no guarantee, stated or implied, regarding: 1) the number of participants or the age of participants taking the Tour. 2) the amount of time that Mallku or other specific guides will be personally leading the Tour. 3) the time spent at any given location on the Tour. 4) photos posted on this website or visiting any specific sites shown on photos on this website. 5) the quality of meditations, ceremonies, spiritual experiences, or other subjective experiences on the Tour. 6) any other aspect of the Tour. RATES: See Rate Schedule below for the rates for the Tour. Quoted rates are only valid for period specified. Whenever the full payment for the Tour is made by Tour Participant, that is when the rate is fixed. That rate will not change. However, the Tour Organizers reserve the right to offer and publish different rates for other potential Tour Participants (higher or lower) prior to the Tour. ROOMMATES: If any Tour Participant wants to pay for the Tour at the shared-room price, yet does not have a specific roommate, the Tour Organizers will attempt to match that Tour Participant with a roommate. However, the Tour Organizers cannot guarantee that a roommate will be found. If no roommate is found, then an additional single-room supplement must be paid by the Tour Participant. If the Tour Organizers match the Tour Participant with a roommate whom the Tour Participant deems unsuitable, then the Tour Participant must pay for the single supplement for him or herself and also for the unsuitable roommate. There will be no refunds for complaints about roommates, and if any Tour Participant cancels the Tour because of a roommate, there will be no refund. 1) Accommodation in single or double rooms at hotels mentioned in the itinerary, or hotels of similar category. 2) Transfers and sightseeing by coaches or by taxi. 4) The services of our representative at all airport transfers. 5) Expert tour leaders for entire journey. 6) An English speaking guide on sightseeing Tours. 7) Entrance fees to all monuments and museums visited on the Tour. 9) 7 other meals (lunches and dinners) specified in the itinerary. 1) Anything not specifically mentioned in the itinerary. 2) Inoculations or any other medical attention. 3) Travel expenses from home to Peru. 5) Tips and gratuities to drivers, guides, and bellboys at hotels. 7) Any beverages, alcohol or items of personal nature, such as laundry, telephone calls, cover charges, etc. 8) Gratuities and taxes for personal services and purchases. 9) Travel, accident, baggage, health, or life insurance. 10) Any increases in airfares, entrance fees and Government imposed taxes. 11) Expenses for guides or transportation not included in the itinerary. 12) Meals not specified in the itinerary. CANCELLATIONS: All requests for cancellation must be submitted in writing, via email or fax. Those canceling their booking will forfeit their nonrefundable registration fee. Also, they will be charged an additional cancellation fee as per the following schedule, no matter what the reason for cancellation: If the Tour is canceled 91 days before departure date, there will be a cancellation fee of 25%, 81 days before departure, cancellation fee of 50%, 71 days before departure, cancellation fee of 75%. There will be no refund if the Tour Participant cancels 61 days before departure or later. Regarding airline cancellations for airfare from participant's home: Tour Participants are responsible to get their own refunds on their tickets from the airline carrier from which their ticket is issued. Some airline tickets might have penalties or surcharges for cancellation, or may be completely nonrefundable. The Tour Organizers will take no responsibility or liability for losses due to cancellations. There will be no refund for any participant who leaves the Tour prior to its conclusion, for whatever reason. CANCELLATION BY DIVINE TRAVELS: Divine Travels reserves the right to cancel the Tour if there is not a sufficient number of Tour Participants registered for the Tour. In such a case, Tour Participants who have paid a registration fee or made a full payment will receive a full refund. Therefore, Tour Participants are advised to get travel insurance to cover flights in case of cancellation. BAGGAGE: Weather and loading and unloading can cause more than usual wear and tear to luggage in Peru. Accordingly, all luggage should be capable of withstanding rain and rugged treatment. The Tour Organizers will not be responsible or liable for any lost or damaged baggage or personal effects. RESERVATION RESTRICTIONS: Any prospective participant with a disability, pre-existing medical condition, or medical history requiring special attention or treatment should advise the Tour Organizers at time of booking the reservation and are advised to consult with a medical specialist prior to reserving space in the Tour. People who are unable to travel alone or who would require special assistance or handling must be accompanied by a companion who will provide the required assistance. The Tour Organizers assume no responsibility for any cases such as these. INSURANCE: All Tour Participants are advised to get travel, medical, accident, cancellation, and baggage insurance independently. The Tour Organizers carry no insurance whatsoever for the Tour Participants. Participants are strongly advised to get travel insurance. Insurance can be obtained from Adele McIntosh at Legendary World: 760-230-5624. Tour Participants are advised to carefully read the Cancellations policy above. No matter what reason, that Cancellations policy is in effect. No exceptions will be granted. Therefore, Tour Participants are strongly advised to carry travel insurance. NATURE OF TOUR: Tour Participants should be prepared, and in physical condition, to walk at least two hours per day. Much of the walking will be up steep inclines and steps at very high elevations. Some physical preparation to get in shape in advance is highly recommended. Portions of the Tour could be considered rustic and rigorous and are best approached with a spirit of openness and adventure. Portions of the Tour may be at higher elevations or in remote locations, where there may be no telephones or means of rapid evacuation in case of emergency. Smoking is not permitted in buses or at meals or during lectures, activities, and ceremonies whether held indoors or outside. 1) All Tour Participants should be healthy in mind and body. 2) Tour Participants should visit a qualified Medical Doctor before leaving for Peru to obtain any recommended vaccinations and procure whatever medicine their physicians prescribe. No vaccinations are required for travel to Peru. See: http://wwwnc.cdc.gov/travel/destinations/peru.htm for more information about recommended inoculations and health information for Peru travel. Many doctors will provide antibiotics or dysentery medicine to take on the trip, and participants should avail themselves of that opportunity. 3) Be very careful of altitude sickness at heights in excess of 9000 feet. Drink plenty of water when traveling to high altitudes. 4) All participants must have enough prescribed medication to last them for the duration of their stay in Peru, if undergoing any medical treatment or taking medication. 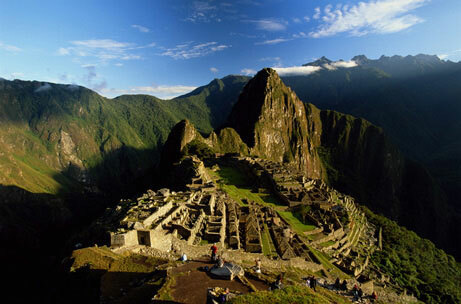 5) Peru hotels may not be as modern or luxurious as hotels in the West. 6) While in Peru, Tour Participants are advised not to drink any tap water, even to brush their teeth, and not to eat raw salads, raw fruits or raw vegetables. If Tour Participants want to purify their drinking water, they can either bring a 220-volt heating coil for boiling water, or they can use water-purification tablets or a water purifier, which is available at any camping store. 7) Tour Participants are warned that pickpockets abound in crowded areas and that muggings in Cusco are on the rise. Therefore Tour Participants are advised to leave all valuables in the hotel safe, including passport, credit cards, and other identifying papers. 8) Tour Participants are advised to leave valuable clothing, precious jewelry, valuable papers, and all unnecessary items at home and not take them to Peru. 9) Clothing could get dirty and wrinkled and might get damaged. The Tour Organizers are not responsible for any lost, stolen, or damaged property during the Tour. 10) Tour Participants are advised to make photocopies of your passport. Take one copy with you to Peru, packed in separate luggage from your passport. Leave the other copy at home. 11) Tour Participants may have to sit on the wet or cold ground or on a mat. Chairs will not be provided. Participants are advised to bring their own cushion if they want one. 12) The Tour Organizers are not responsible for Tour Participants' health problems during or after the Tour. PUBLICATION RELEASE: Representatives of the Tour Organizers may be photographing, audio-recording and/ or video-recording the Tour. The Tour Organizers reserve the right to publish any such photographs, audio recordings, and video recordings without obtaining further consent from any participant. Each participant releases The Tour Organizers and its representatives from any liability in connection with any such use of such photographs, audio recordings, and video recordings. RIGHT TO REFUSE SERVICE: The Tour Organizers reserve the right to accept, decline, or retain any person as a participant at the Tour at any time without liability and without any obligation to pay a refund or any other amount whatsoever. The Tour Organizers take no responsibility or liability for any participant who leaves the Tour prior to its conclusion or for any activity undertaken by any participant that is not included on the Tour itinerary. WAIVER: The Tour Participant shall indemnify and hold Tour Organizers free and harmless from any and all claims, losses, damages, injuries, and liabilities arising from or on account of the Tour Organizers' activities or omissions in connection with this Agreement, as well as the costs, including attorneys' fees, of defending against them. By signing this Tour Participant Agreement, the participant releases the Tour Organizers and its representatives from all responsibility and liability. AGREEMENT: This Agreement may be modified only by the written consent of both parties hereto. This Agreement represents the entire Agreement between the Tour Participant and the Tour Organizers with respect to the subject matter hereof. There is no other contract or agreement between the Tour Participant and the Tour Organizers, stated or implied. There shall be no waiver of the rights of the Tour Organizers by the failure to enforce that or any other right hereunder. If any part of this Agreement is held to be illegal, void, or unenforceable for any reason, such holding shall not affect the validity and enforceability of the rest of the Agreement. PERSONAL RESPONSIBILITY: By signing the agreement form below, the Tour Participant agrees as follows: "I am entirely responsible for my own personal safety, health, and mental, physical, emotional, and general well-being during and after the Tour. I release the Tour Organizers and their representatives, and any of their employees, assistants, and affiliates, of any liability for any injuries or damages mentally or physically I or any of my family members might incur during or after the Tour. I understand that the Tour is in no way psychotherapeutic or medical in nature. The Tour is not involved with the treatment of disease of any kind and does in no way substitute for medical diagnosis or treatment. The Tour leaders and guides do not treat, prescribe, or diagnose any illness, disease, or any other physical or mental disorder. Any personal suggestions, readings, or answers to my questions that are received on this Tour are for educational purposes only and are not meant as advice, prescriptions, or recommendations. I release Tour Organizers and their representatives and any of their employees, assistants, and affiliates from any injuries or damages mentally or physically that I or any of my family members might incur during or after this Tour as a result of following any suggestions given to me on this Tour. I release Tour Organizers and their employees, assistants, and affiliates from any obligation to fulfill any claims about this Tour that have been printed or spoken in any tapes, lecture, letters, literature, the Internet, websites, or the news media." NOTE: If you plan to participate in more than one tour, please fill out a separate form for each tour. If there is more than one person in your party, please fill out a separate form for each person. When filling out this form, use the tab key or the mouse in order to move the cursor to the next space. DO NOT use the return key until you are ready to submit the form, since the return key might automatically submit the form by mistatke. If you make a mistake and the form gets submitted by accident, simply click on your browser's "go back" arrow and fill out the form again. If there is more than one person in your party, please fill out a separate form for each person. When filling out this form, use the tab key or the mouse in order to move the cursor to the next space. DO NOT use "autofill" to fill out the form. It will not work properly with this form. DO NOT use the return key until you are ready to submit the form, since the return key might automatically submit the form by mistake. If you make a mistake and the form gets submitted by accident, simply click on your browser's "go back" arrow and fill out the form again. Your credit card will not be charged twice. I am entirely responsible for my personal safety, health, and well-being during the Tour. I hold the Tour Organizers harmless for anything that might happen to me or to my possessions on this Tour. I understand that no health insurance or travel insurance will be provided by the Tour organizers, and, if I wish to be insured, I have to do this myself. I have read and understand the foregoing Tour Participant Agreement. * Where did you find out about the Tour? "ANDEAN MASTER PATH: SOLAR INITIATIONS"
Our amazing tour includes all transportation within Peru, hotel accommodations with breakfast, entrance fees to sites, ceremonies, and amazing Shamanic Andean guides. It does not include your international flight. Passport required for all travelers. Visa for USA citizens is free and issued at port of entry. No immunizations required for passengers from the USA. Please ask your roommate to fill out a separate online form. EXTRA NIGHTS in Lima before or after tour are available for $150 per night, per room. Your nonrefundable reservation fee of $900 and your balance will be charged within a week or two after you fill out this form and submit it. After your payment is charged to your credit or debit card, you will get a receipt via Email. - International flights from home nor its airport taxes. I now authorize charges to be processed against my credit or debit card account in the amounts that I have selected on this registration form. I understand that charges will appear on my credit or debit card statement as "Divine Revelation," and I now authorize these charges to be made according to the payment schedule stated on the registration form posted at https://www.spiritualityproducts.com/secure/PeruRegister.html. I fully agree to the terms and conditions of the Tour Agreement Form, posted at https://www.spiritualityproducts.com/secure/PeruRegister.html. Please note: Pre-paid Mastercard or Visa cards are not accepted. Want to speak to us on the phone before registering? Call and leave a message 24 hours a day: 503-471-1608. We will call you back. MAKE A MISTAKE ON YOUR FORM? PLEASE CHECK AND CORRECT IT NOW BEFORE SUBMITTING IT. Thank you for making your full payment for the Peru Tour with Mallku, including the nonrefundable reservation fee of $900. We will process your debit or credit card payment manually and will send you a confirmation email when we have time to do that. Please be patient, because sometimes we are traveling overseas and might not process your debit or credit card right away. Please print out a copy of this form for your records so that you know what you have agreed upon in this legal contract. THANK YOU.